Condos and apartment buildings are seen in downtown Vancouver, B.C., on Feb. 2, 2017. 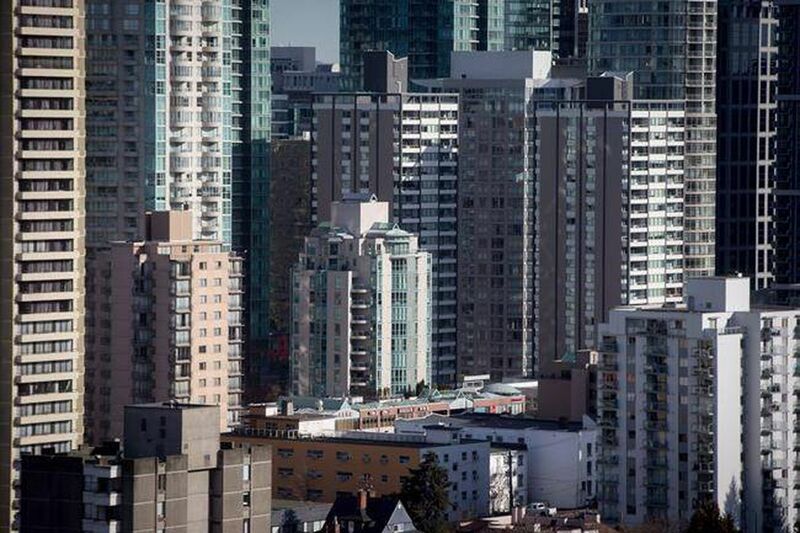 The Real Estate Board of Greater Vancouver says demand continues to be high for condominiums and townhomes in the region, but less so for detached properties. The board says 1,818 homes sold in January — up 19.4 per cent from the same time last year, but down 9.8 per cent from December 2017. However, townhouse and condo sales were above the 10-year January average by 14.3 and 31.6 per cent respectively, while detached homes fell 24.8 per cent below it. The board says the sales-to-active listings ratio last month, which looks at how many properties sold compared with those listed, was 57.2 per cent for condos, 32.8 per cent for townhouses and 11.6 per cent for detached properties. A figure below 12 per cent for a sustained period suggests downward pressure on prices, while jumping above 20 per cent for several months indicates movement in the opposite direction. The board says the composite benchmark price for all types of properties in the area was $1,056,500 in January — up 16.6 per cent from the same month last year and 0.6 per cent higher than the previous month. The benchmark price for detached homes was up 8.3 per cent from the same time last year at $1,601,500. It was up 27.4 per cent for condos at $665,400 and 17.5 per cent for townhomes at $803,700. REBGV president Jill Oudil says in a statement that demand remains elevated and listings scarce for attached homes and condos, while buyers looking for detached homes face less competition and have much more selection.